Well, last year we had a fair amount of success doing some interviews with game designers and publishers about their new offerings at SPIEL. This year, we’re going to continue with a series of interviews, but we’re going to try to keep them short and sweet, just 16 questions and answers! Dale Yu #1: OK Tony, thanks for taking the time to chat with me. I’m excited to get a peek at the rules to your new game, Snowdonia. But save me some time — can you give me the “elevator pitch” of the game? 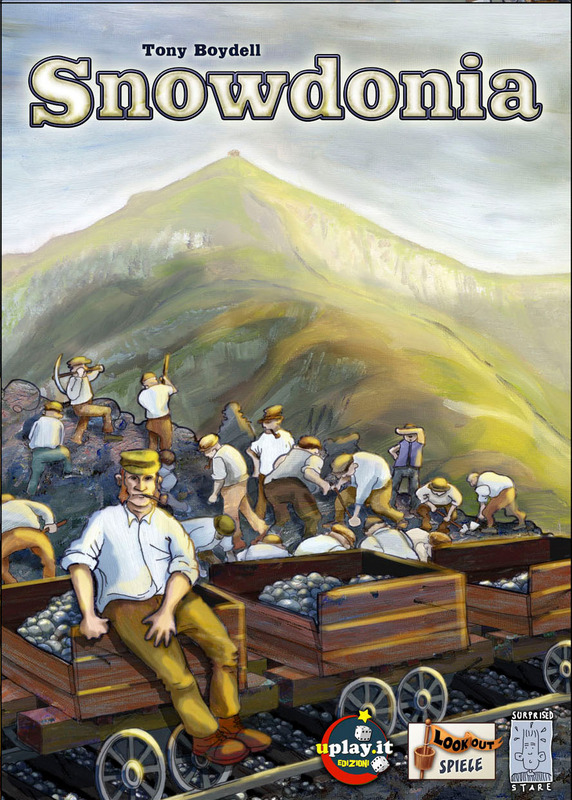 Tony Boydell: Snowdonia is a railway game with just the one route – no stocks, no money, no networks and no hexes! Free of the cliches of the genre, we’re not Top Hatted entrepreneurs but small teams of strong-armed Navvies digging our way up a mountain and suffering the vagaries of the wilderness Weather! This game gets you intimate with theme! Side note: Our little company has produced quite an eclectic series of products over the years and we don’t really have a ‘brand’, apart from – maybe – our desire to have games with a ‘twist’ in them; something at 90 degrees to expectations! Tara Seat of Kings had the unusual ‘ripple’ mechanic, Confucius the ‘gift giving’, Fzzzt! the deck-building with auctions, Totemo the 3D and colours and Paperclip Railways the, er, paperclips! Snowdonia’s USP is the weather and events though I’m always trumpetting the authenticity of ‘game to theme’ as this has driven the whole project along! DY #2: So, since you (and your company) are concerned with the theme – how did this come about? Did you have to endure a train ride through typically awful British weather and that made you think of a game? DY #3: Interesting… Just did a Google search for Snowdon – https://www.google.com/search?q=snowdon&oe=utf-8&um=1&ie=UTF-8&hl=en&tbm=isch&source=og&sa=N&tab=wi&ei=EtQ8UOnCDsuf6QHNaw&biw=1920&bih=913&sei=FNQ8UPjqJOXV6QGJyoCIDA – not much there at all! Though there are a few pictures which include the railway and the sad solitary train… I guess you went with Snowdonia instead of Yr Wyddfa because it was easier to spell and pronounce? I can’t even figure out how to say the Welsh name! The actual train chugging up Snowdonia. Definitely bleak. DY #4: Really – it’s used as preparation for Everest ascents? Am I missing something here? According to Wikipedia, the peak is at 1,085m (3,560 ft). That’s like saying that I’m going to play Connect 4 to get ready for Agricola! TB: It’s a viciously-changeable, and notorious, climate in them thar hills, you know! Rain, snow, fog, rain, hail, sun, rain etc – and there’s some good climbing to be done as well! After his first review of the game, Hanno suggested I might expand the weather mechanic to reflect the often two faces of Snowdon: sunny at the bottom, torrential rain/pea-soup fog at the top and vice versa! It’s a great idea but perhaps a few steps of in-game admin too far…but it would make a great variant at some point. DY #5: OK, so lets get back to the game. You say that it’s a single line in the game – which is what i’ve seen in the pictures – and no stock. So the game will feel more like Age of Steam than 18xx. i.e. players will be trying to connect up the different stations with track as opposed to collecting shares and hoping their lines increase in value? 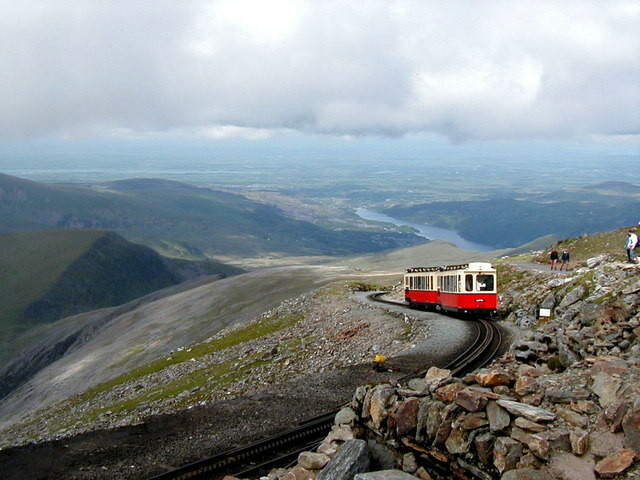 TB: Not really, no – the Snowdon railway is built from the bottom to the top, sequentially. Players compete to excavate the route (for subsequent track laying) and build sections of the various stations – some bits are worth more than others so you will want to ‘do it first’. The VPs are all to do with how much you’ve contributed to the route and the buildings along it regardless of ‘in a row’ or in specific locations…which is where the “Contract cards” come in. 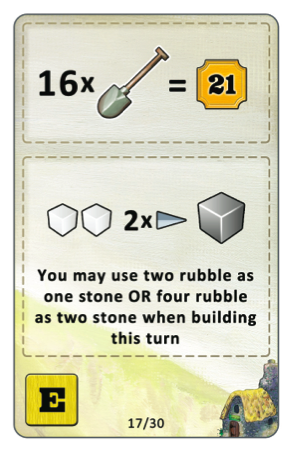 Contract cards (gained via an action) provide a once-only in-game effect as well as an end-game scoring element; the latter might be ‘build X pieces of the track to gain 30 points’ or ‘dig up Y pieces of rubble for 11 points’ etc. While you score, mostly-modestly, for the bits and pieces, you REALLY begin to score by fulfilling the criteria on your Contract cards! Unhelpfully (smiley face), you don’t start with any Contract cards to guide you – you need to find your own way as the game progresses – eyeing up the cards as they come out, the weather forecast, what the other players seem to be doing and – importantly – what’s happening with the Events track. The resource collecting (ore, coal, stone) and conversion (steel bars, more stone) actions are there to provide the materials you need but it’s what you do with them, and when, that really counts. DY #6: Hmm, Contract cards that offer a lot of VPs… Sometimes that mechanic gets me worried because what if someone is simply luckier than I am and manages to randomly draw all the higher scoring cards? Is that something I need to worry about with Snowdonia? TB: Randomly drawing your Contract cards? *ptoooey* (ting!) Fret-ye-not, sirruh – I share your displeasure at such things! Snowdonia’s cards of power are display in a selection of three to be ‘selected from’ by players who take the appropriate action (‘the Office’). Cards are replenished to some extent every round (NOT during the action resolution); at least one moves off automatically, in addition to those drafted by the players, because the weather mechanism uses the unrevealed card on the top of the Contract card deck. The ‘luck’ is which cards come out in that upkeep phase…whether you value taking a card over the other actions depends on where you are in the starting order, your experience with the game and – of course – if there are any spaces left in the ‘office’ action! All of the actions have a limited capacity for labourers so you need to get into some of them quick (at the sacrifice of others) and, like all good Euro games, the number of spaces is adjusted according to the number of players (evil grin). As a side note, the in-game effect and the end-game scoring elements of a Contract card are distinct from each other ie. 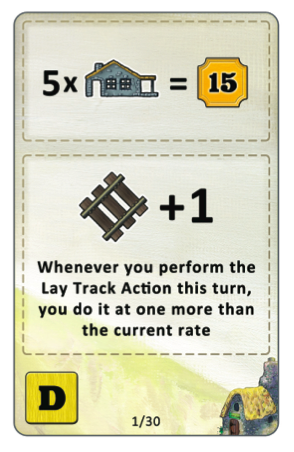 you won’t find a track-forging effect on the same card as a ‘build X pieces of track’ bonus. DY #7: Are the contract cards left open? From what you describe above, I should be able to see what people draw. But am I forced to remember that information? TB: They’re left open (thanks for the gentle rules nudge)! Very important as that memory business is undesirable too. You rotate them 90 degrees to show they’ve been used. DY #8: Snowdonia sounds a bit complicated, though not overly so, and I see that you’ve rated it for 8+. If I asked you to judge to complexity in terms of other train/rail games, where does it fit in this spectrum: Transamerica / Metro / Ticket to Ride / Union Pacific / Chicago Express / Canal Mania / Age of Steam / 1830? TB: I’d say after Canal Mania but before Age of Steam. It has a reassuring worker placement feel to it and the round structure is only seven action types and some pieces of upkeep – not exactly mechanical engineering for the ordinary gamer! Timing is important, though; I’ve already mentioned the contract cards – knowing them is good (and their ‘viability to complete’ varies depending on the number of players) – but you also need to keep an eye on the weather (which affects key actions from round to round) and the resource bag – the emptier THAT gets the more often the game initiates Events that move the game along quicker…with or without you! DY #9: Sounds good. It definitely sounds like the type of game that my group will like! So what about the production and art? I know that you’re going with Lookout – are you going to use Klemens for art and whichever European production house is in favor with Chez Lookout this year? Hopefully all the pieces will be punched out correctly! TB: I can’t say about the manufacturing as I’ve left that to Klemens and Hanno to sort out (God Bless ’em), but the Art – now, there’s a subject close to my heart! Charlie Paull, Mrs to Mr Alan in the other half of Surprised Stare Games, painted me up a gorgeous Mount Snowdon which you can see on the various art samples I’ve posted. I used some large pieces of tracing paper to layer the workmen, the trucks and the ‘lazy navvy’ taking a break from his exertions. Klemens brought everything together for the game board, the rulebook and the cards and I am simply astonished by the final product! The colour palette is all yellows, greens, oranges and browns to reflect the earthy environment and those Summer mountain colours – the whole thing just looks gorgeous! DY #10: Well, I must say that I like your box… So, I see on that box that you currently have partners in Germany and Italy. Anyone else getting on board before Essen? Will you be looking for other partners at the fair? TB: Those guys are in on the first print run – we’re taking the English copies. For the US, we’ve arranged with Funagain for them to take pre-orders as it’s cheaper than posting EN copies from the UK across the Atlantic (we see Nick every year at Essen, so he’ll just be popping by with a trolley to take his copies away for shipping). As for other partners? Well I’m hoping we can meet up with a few people at Essen Spiel but, really, it’s so involved dealing with this edition that I daren’t think further than October at the moment! DY #11: so that partially answers my next question: how will people get a copy? In the US – Funagain. In the UK? In Germany – I assume it will be available by whatever method Lookout Games are usually available. Is it kosher to ask how many copies will be printed? How many will be sent to the US? TB: US-homed gamers should, indeed, approach Funagain; all other English language orders should come through us (feedback@surprisedstaregames.co.uk). Lookout Games have their own mechanisms (buero@lookout-games.de) as do Uplay.it (http://www.uplay.it/gioco_da_tavolo-Snowdonia.html). All pre-orders and Essen purchases will come with one or more promo cards (I couldn’t resist, sorry!). The only copies currently destined for the US are those going via Funagain – Surprised Stare Games, being so tiny in the grand scheme of things, doesn’t have a distributor there yet and the various fulfilment deals on offer are just not viable at this point. Snowdonia is our biggest break to date and we’re all still a little dazzled! We have a 3,500 copies in the first print run. DY #12: OK, so I see you’re dangling the ever-enticing Essen promo card in front of prospective buyers. So, the copies that Nick brings back will NOT include that promo card, correct? And – are you going to spill any of the details of the promo? TB: I will make sure Nick has enough promos for ALL the copies he brings back with him. In fact, if someone misses out all they need do is thumb my BGG blog one day and send me a begging Geekmail and I’ll just pop one in the post! And, yes, for you – just because it’s you – my MAIN design for a promo card is an eighth train (there are, er, seven in the basic game of which six are used). Over here in the UK, anyone ‘of a certain age’ remembers the children’s author/illustrator pairing of Oliver Postgate and Peter Firmin; they have a wonderful back-catalogue of television programs: Bagpuss (lost objects), Noggin the Nog (vikings), the Clangers (space mice on a tripped-out Moon) and the tales of a hard-working railway engine called Ivor. Ivor lives ‘in the top left hand corner of Wales’ (so, Snowdonia then!) and works on a tiny branch line for the Merioneth and Llantisilly Rail Traction Company Ltd – thrillingly (at least for me as a MASSIVE fan), we have permission to use Ivor as our extra train :-) God, I love my hobby! The promo is an eighth train. I don’t have a picture of that, but this is the picture of the most basic train in the main game. DY #13: Hmm, not the way I thought you would have gone with that. While I’ve been asking you all these questions, I’ve been reading up on Snowdon. It appears, according to the always accurate Wikipedia, that: “The SMR (Snowdon Mountain Railway) was the inspiration for the fictional Culdee Fell Railway, appearing in the story book “Mountain Engines”, part of the “The Railway Series” written by the late Reverend W. Awdry. The Railway Series books were the basis for the popular Thomas the Tank Engine and Friends children’s television series. Did you consider doing a Thomas card? 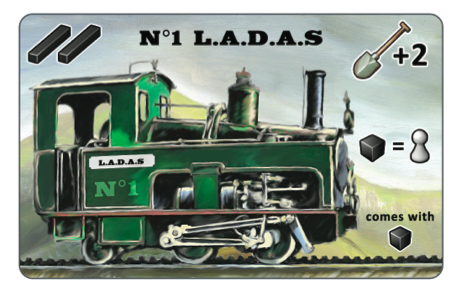 or maybe a Toby the Tram Engine card? Is there some licensing option in the future? TB: Yes – I have a copy of the Thomas TTE book but I’ve always found it a little sterile (and upper middle class) for my taste; the early books are quite fun, especially when ‘the Fat Controller’ walls up an engine in a tunnel because it didn’t want to come out while it was raining…elements of Thomas Harris in there, methinks! As soon as we linked up with Lookout, I knew immediately what I would do for the promo – Ivor and his creators are a major part of my growing up; more so when my children came along – they’ve all suffered me reading Ivor’s adventures in a variety of outrageous Welsh accents! 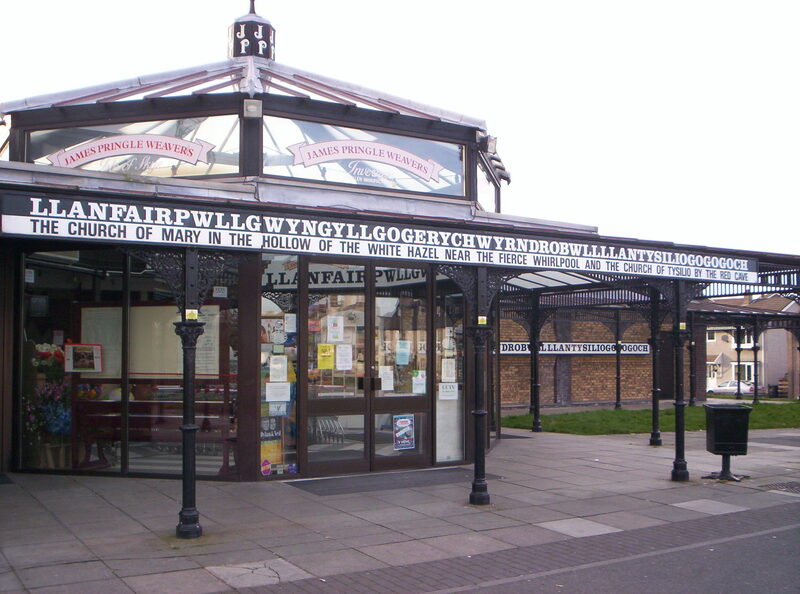 I do have a promo card idea for an extra station too: “Llanfairpwllgwyngyllgogerychwyrndrobwllllantysiliogogogoch” – the name takes up half of the station card! DY #14: That would be sweet. That promo card could go to anyone who could come up to the stand and pronounce the name! Though why you wouldn’t just call the station “Saint Mary’s Church in the hollow of the white hazel near a rapid whirlpool and the Church of St. Tysilio of the red cave” in the first place is beyond me! But let’s stick to the stuff we know will be at this year’s Essen… So, the game and the (first) promo will be available on your stand as well as at Lookout. How many bananas will it me? Will you take Pounds sterling at the booth? What about dollars? Drachma? DY #15: Oh I’ve done that too. Watch out, there are always Lookout groupies who will come up to you trying to get Agricola promo cards from you – they just assume everyone in an orange shirt has the cards! For those of us who don’t speak English/German/Italian/Welsh, is the game itself language independent? TB: I can make a batch of my own home-grown ‘Gric cards if need be *evil grin*. The Snowdonia rule book and the card text are language-dependent, though I’ve tried to provide a basic iconography for the one-off effects. Interesting you should mention Welsh…there won’t be a Welsh version of the cards, but I _do_ have contacts for producing a Welsh version of the rulebook :-) We would pop that on the Surprised Stare Games web pages for download at some point. DY #16: Well, I’m definitely excited to see Snowdonia. I mean the game, not the hill. I’ve seen enough pics online of the mountain itself, and frankly, it’s not really making me want to trek to Wales right now… I guess I’ll give you a softball for the final question here… What else can you tell me (and the blog readers) to make me want to give the game a try? TB: Let’s try a bold, assertive statement: Lookout Games selected Snowdonia for publication shortly after seeing the prototype. Lookout Games have an impeccable pedigree (Agricola is the Best Board-game in the World – there is no contrary argument to this statement)) and it can, therefore, be extrapolated that Snowdonia is something worth taking a look at! 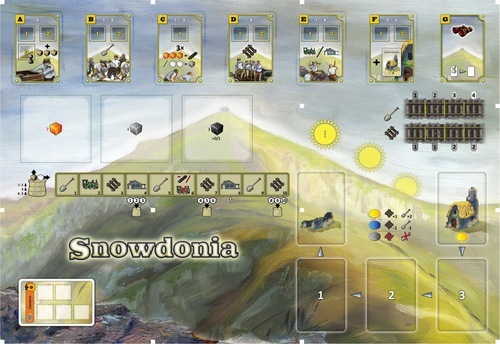 Also, you _could_ take a look at this video: http://www.boardgamegeek.com/video/18124/snowdonia/uk-games-expo-demo-of-snowdownia – two handsome men engaged in playful but informative banter; what more could you possibly ask for? DY: Well, thanks again for taking some time to talk about Snowdonia! It looks great from what I’ve seen, and I’m off to read the rules now (to preview in a later Essen Preview post!) Catch up with you in Essen! 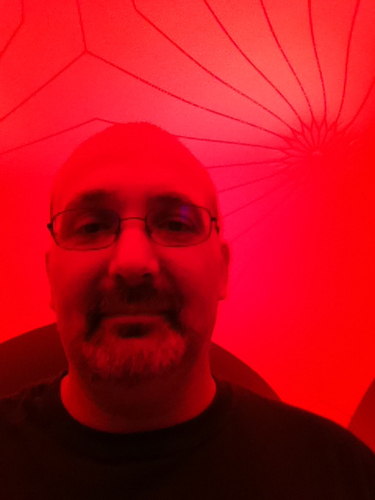 This entry was posted in Essen 2012, Interviews. Bookmark the permalink.